Don't be put off by the large amount of rosewater, it has such a delicate flavor you hardly taste it. If you can�t find rosewater or just really hate it, you can substitute 1/2 tsp vanilla extract. This is a fairly large cake, next time I might divide it between two pans and freeze one for later. However, we ate it over the course of a week and it was nearly as good on the last day as it was on the first. Preheat the oven to 350 degrees F. Butter and flour a 10 inch round cake pan. Cream together the butter and sugar until light and creamy. Mix in the lemon zest and rosewater. Add the eggs, one at a time, beating thoroughly after each addition. Fold in the ground almonds, ground pistachios, flour, baking powder and salt. Pour the mixture into the prepared pan and bake for about 40 minutes or until a tester inserted in the middle comes out clean. 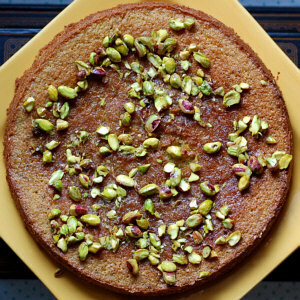 To make the glaze, heat the pistachios, sugar, lemon juice and zest in a saucepan over low heat until the sugar has dissolved and pour it over the cake.